Riding the MBTA subways . . . all of them! The Orange Line gets more upscale advertising than the Red Line’s Mattapan extension. The riders on the B branch of the Green Line are on average much younger than on the other lines. A free doughnut may not taste better, but it’s worth the price. These were some of my lessons from spending yesterday riding the subway system of Boston in its entirety. Why do such a thing? Thank the MBTA: the Massachusetts Bay Transportation Authority, or “T,” the organization responsible for mass transportation in the greater Boston area. [i] The MBTA was unable to maintain regular service during our record-setting winter snowstorms. [ii] So they decided to make the entire system free, charging no fares, all day, Friday, April 24. 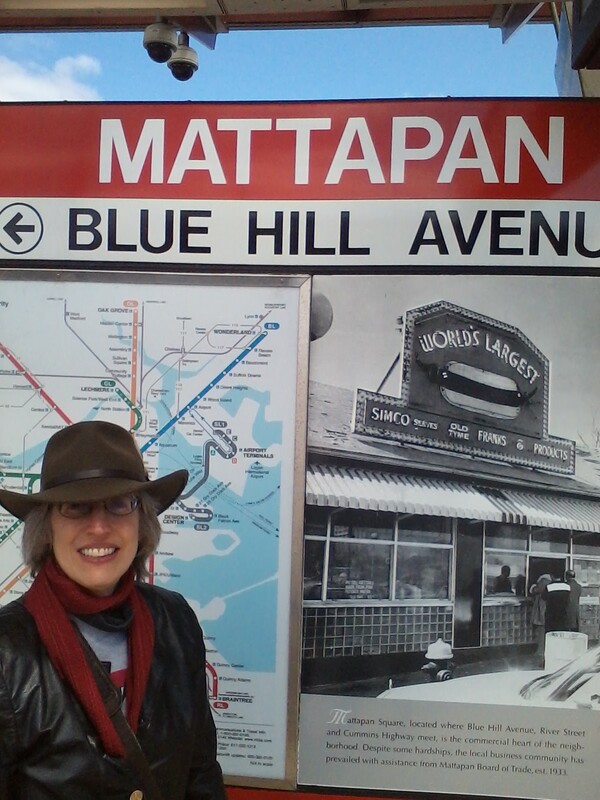 E. J. at the Mattapan station, which I’d never visited before. E. J. Barnes and I had talked about spending a day riding the entire system, just for the fun of it. Well, with free fares, how could we resist the opportunity? Now, when I say the “system,” I don’t actually mean the entire MBTA system. The T runs commuter rail lines, buses, subways, and even some ferries. Trying to ride all of them would take days. No, what we had in mind was riding the subway system. You learn a few things about the Boston area riding the subway. For all that there are integrated neighborhoods in the Boston area, a lot of the region is racially and economically segregated. There are sections of lines with predominantly black riders, and lines with overwhelmingly white riders. There are a lot of Asian riders near the Chinatown stop. (This was not a surprise.) The riders on the B branch of the Green Line are much younger than most because the route passes through the Boston University campus. Brookline, which although surrounded by the City of Boston on three sides is a separate municipality, is wealthier than surrounding Boston neighborhoods, as one can tell from looking at the buildings. 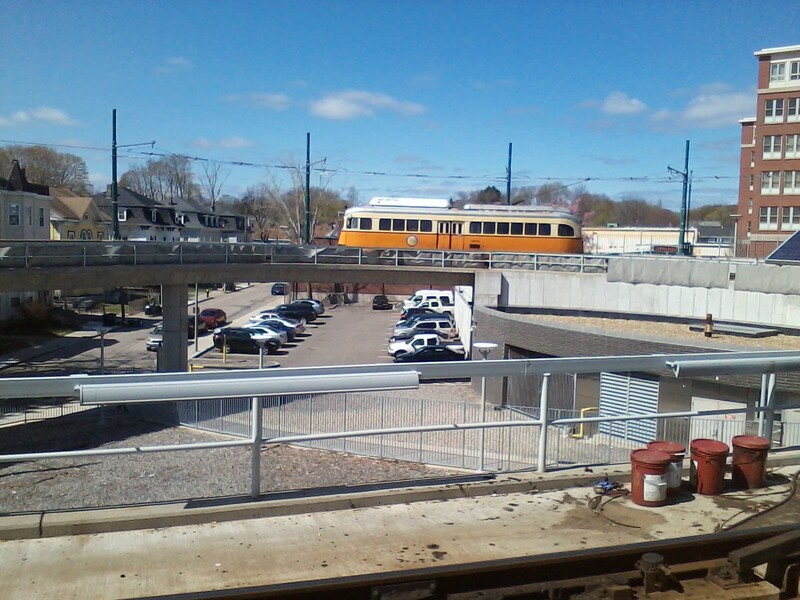 The Mattapan trolley. They use an old jet engine to clear this line’s tracks. And you learn some things about the T as well. The Green Line is the most crowded line, especially on the B branch. But it would be hard to do much about it, because the B branch runs along the surface west of Kenmore and makes frequent stops. The Orange Line begins and ends in wealthier neighborhoods, which explains why it gets more upscale advertisements. The Green Line’s E branch is the only line that runs at the surface on a road without a dedicated lane, which makes it vulnerable to traffic jams. The Mattapan trolley, an extension of the Red Line’s Ashmont branch, is absurdly antiquated. And the T has trouble keeping up with maintenance, as the squeaking doors, banging metal plates, and service delays on the Red Line due to a signal malfunction at Harvard attest. On the other hand, we rarely had to wait long for a subway train or bus. And some MBTA cars are outfitted with truly neat extending ramps to make it easy for wheelchair-bound users to get on and off. In fact, making the station handicapped-accessible is one of the reasons the Government Center station is currently shut down. [vii] It’s part of a system-wide effort. You didn’t know Boston had a molasses flood? The company that owned the ruptured tank claimed anarchists had destroyed it, but the courts ruled that the company was at fault. The passengers came and went with the hours. Our trip from Park Street to Braintree on the Red Line was at the height of afternoon rush hour, so the cars approached a level of standing crowds usually seen only on the Green Line. On the other hand, when we rode the number 2 Silver Line route, it was well after work hours, so for about half of its route we were the only people on the bus. As you might expect, a lot of people were using their smart phones to read or listen to music or play games, which is probably a sensible thing to do in the rush hour crushes in particular. 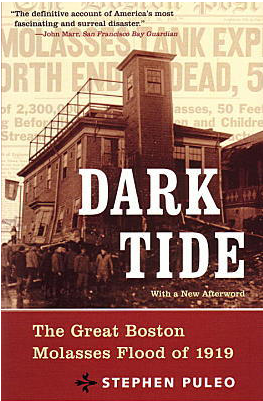 I did see one fellow reading a familiar book, Stephen Puleo’s book on the Great Boston Molasses Flood of 1919, Dark Tide. We figured that the T scheduled the free fare day to coincide with school vacations, but it’s not as if we saw a lot of children, except for one group (class?) at Wellington. And the free doughnut? Dunkin’ Donuts is an ubiquitous chain in New England, and they even have several stores inside T stations. So those stations were giving away a free doughnut if you showed them your CharlieCard, the T’s reusable plastic fare card. It’s named after Charlie, a fictional victim of the incredibly complicated fare schedule the MTA (as it was then called) had back in the late 1940s, as described in this mayoral campaign song that’s become a folk classic. [i] “Greater Boston” can stretch as far as Providence, Rhode Island when it comes to the commuter rail service, but the system is largely confined by the old state highway 128, a highway that arcs around Boston and coincides with Interstate 95 for much of its length. [ii] People blamed the MBTA management. The system manager resigned, and the governance is being restructured. But let’s be honest here. It was the heaviest year for snowfall since records started being kept in 1872. And people dislike paying taxes and fares, so the MBTA has to manage with old equipment and systems that are always on the verge of a breakdown. [iii] The four hub stations form a rough rectangle in downtown Boston. The Red Line divides into two routes at its southern end, while the Green Line splits into four routes to the west, which explains how four lines can have twelve end points. [iv] The idea behind the Silver Line was originally to build a subway to replace the old southern part of the Orange Line, demolished and relocated in the 1980s. This left Roxbury with no subway service, so the MBTA committed to building a new line, only to balk at the cost and renege on its promise. The T has been trying to convince Roxbury that buses are good enough ever since. So calling it the “Silver Line” is a public relations gimmick. Though in their effort to win over Roxbury, the MBTA has outfitted the Silver Line’s Roxbury routes with electronic signs telling riders when the next bus is coming, the only bus line so equipped. [v] This isn’t obvious from the schematic diagram of the system the MBTA uses. You have to look at the geographically accurate system map, instead. [vi] You want to know our exact route? Walk to Central Square. Red Line outbound to Alewife. Red Line cross-city to Ashmont. Red Line extension Ashmont to Mattapan. Bus 31 Mattapan to Forest Hills. Orange Line cross-city to Oak Grove. Orange Line inbound to Wellington. Bus 110 to Wonderland. Blue Line cross-city to Bowdoin. Break for lunch. Walk to North Station. Green Line outbound to Lechmere. Green Line cross-city to Heath Street on the E branch. Walk to Brookline Village. Green Line D branch outbound to Riverside. Green Line D branch inbound to Kenmore. Green Line B branch outbound to Boston College. Green Line B branch inbound to Chestnut Hill Avenue. Walk to Cleveland Circle. Green Line C branch inbound to Park Street. Red Line outbound to Braintree. At that point we had ridden the entire length of all four subway lines. We decided to go on to do the Silver Line, so Red Line inbound to South Station. SL1 (Silver Line route 1) outbound to Logan Airport and most of the way back, stopping at Silver Line Way. SL2 outbound in a loop taking us back inbound to South Station. Walk out of South Station to adjacent Silver Line bus stop. SL4 outbound to Dudley Station. Except for two short bits of the SL4 and SL5 lines at their northern end, that covered the Silver Line. Bus 1 from Dudley to Central Square. Walk home. 27 segments of travel, total. [vii] Trains can pass through it but can’t stop there. Since this stop is in downtown Boston, it’s not a big problem, because the Blue Line’s Bowdoin and State stops and the Green Line’s Park Street and Haymarket stops are nearby. However, it does mean that one can’t transfer directly from the Blue line to the Green Line or vice versa. This entry was posted in Uncategorized and tagged adventure, Boston, Dunkin Donuts, M.T.A., mass transit, Massachusetts Bay Transportation Authority, MBTA, subway. Bookmark the permalink. 12 Responses to Riding the MBTA subways . . . all of them! Sounds complicated, though I suppose no more so than London Underground. We (a group of friends from school) spent a day in the height of summer (school excursion with overnight accommodation at Baker Street’s YWCA—this is long-days ago) trying to clock up the stations and lines, all on a cheapo ticket. In those days most of the stations had a mini cinemas (News Theatres) attached, playing cartoons. You can imagine the effect on a bunch of school kids whose normal TV viewing was house-mistress-restricted. I think the cinemas were closed shortly after so that makes it an historic visit (so we tried to excuse our non-educational behaviour!). It’s nowhere near the complexity of the London Underground or New York City’s subways. Well, it is definitely true; both systems are much more complicated than Boston’s. Interesting thing about the London Underground: the familiar schematic map of the system, which shows the relationship between lines and stations accurately but distorts distances and directions, is so familiar to regular passengers that they give directions and judge distances based on the map, instead of the reality of London geography. But it has to be geographically inaccurate for some stations are close together, others vastly widely apart. The truth would probably look most peculiar, and take up too much space. Not a walk to Coolidge Corner, but to Cleveland Circle. Coolidge Corner was along the Cleveland Circle branch. Oops, confused my CCs. Thank you, corrected! This is Lindsay, Cherry’s friend who works for the T. Wow, this is awesome! I’ve ridden several subway lines from end to end just for the fun of it, but never all of them on the same day…yet! One observation I’ve frequently made about the B line related to is large student ridership is the disproportionate number of occurrences of the word “like” you will hear punctuating background conversations! Lindsay, thanks for stopping by. And I’m glad to hear from a T worker, as well. By the way, your dual roles as an accessibility consultant researcher on neuroplasticity sound fascinating. If you do try for all the lines in one day, two pieces of advice: get an early start, and know where the bathrooms are! I am pretty sure you hit the nail on the head when it comes to the college student B Line riders being so engrossed in conversation that they only spend minimal time on their phones. Hahaha, after taking the B Line so many times, I feel like I keep hearing the same conversation about the fascinating details of college social life replicated time and time again, just with different individuals! 😀 It has certainly been an exciting adventure to switch from neuroplasticity research to learning the ins and outs of the T, at least for the time being! I’m looking forward to hopefully learning more about the technical/operations side of things, which has to be one of the aspects of public transit that I find most exciting. You certainly seem to have an interesting background as well, from everything I’m reading on your Facebook/blog! I’m local and visit Cambridge often, so feel free to let me know if you ever want to meet up sometime and chat!